There are several types of crafts you can make from soda bottles, such as candle holders, bird feeders, knickknacks and even paper weights. There are also a variety of holiday or seasonal projects you can make with soda bottles. Craft items made from soda bottles can be used to decorate your own home, or you can give them as gifts or sell them at crafts shows. 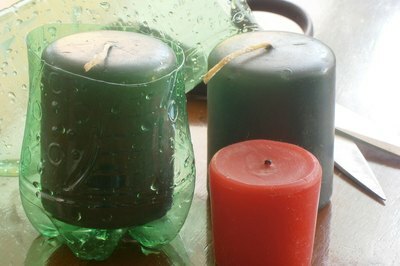 Making candle holders from a soda bottle requires just a few simple steps. This candle holder uses a 20-oz. soda bottle, model paint, ribbons and ribbon flowers. Once the labels have been removed, use fingernail polish remover to clean off the adhesive. 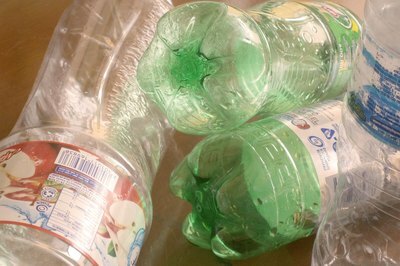 An adult should use a knife to cut a small hole in the bottle, then use scissors to finish cutting the top from the bottle, cutting along the middle of the bottle. The top part of the bottle can be used for a tapered candle. Take the bottom part of the bottle and add a votive holder for placing a votive candle inside. Use model paint because it is designed to stick to the plastic. The candle holders are not very time consuming. They can also be colored to match your home decor or a friend's home decor. The candles can be burned but never left unattended, as the heat from the candle could melt the plastic. The soda bottle dome display has flowers, birds and a general nature look to it. Supplies for this project are a 2-liter soda bottle, something to remove the label, artificial flowers, moss, Styrofoam, household twine, artificial greenery and a plastic butterfly. To cut the top off the soda bottle, use a knife to make a hole, then finish removing the top with a sharp pair of scissors .Remove the adhesive from the bottle with turpentine or nail polish remover. Trim the Styrofoam to fit into the bottom of the soda bottle. Glue the moss to the Styrofoam. Insert the greenery and the flower into the Styrofoam. Select the type of flower you want. A Glue the household twine to cover the bottom of the display. The bird and nest on the top are optional. Use your creativeness and have fun. These Easter baskets are made from 20-oz. soda bottles. Lace, rick rack, paint and any type of trim will be good for this project, and you will need a hot glue gun and glue to attach the trim. An adult should be in charge of the hot glue gun but let the children show you what they want hot glued to their basket. 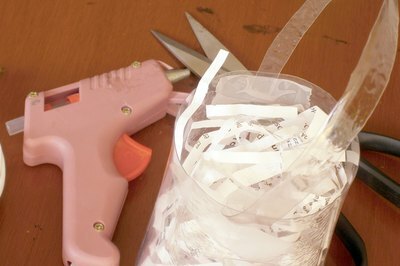 Remove labels with nail polish or other adhesive remover. Adults should cut the bottles, about 2 inches from the top. Once the top is cut off, cut a piece about 1/2 inch for the handle. Using the natural curve of the bottle, hot glue the piece to the inside of the bottle. Let the children decide on the decorations After the baskets are finished add the Easter grass and candy. These could be used as gifts or an easy project for the Sunday School class. 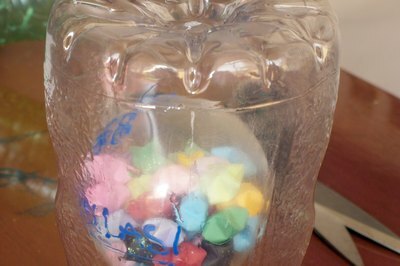 What Can You Make With Plastic Coke Bottles?